I’ve had a series of peculiar things happen lately. In Munich airport last week, I picked up my phone to send an SMS to check on dinner plans that night in Budapest. Before I could type a letter, it beeped with an incoming SMS asking me that very same question. A couple of days later, I again picked up my phone to text a reminder to send contact details I needed. Again, it beeped before I could put finger to button and the message? The phone number I needed. Fair enough. These things happen. I’ve been known to addle a few minds by answering unspoken questions. This time though, I was on the receiving end. And both involved the same person. Perhaps I’m being oversensitive or am overexposed. Had it ended there, I’d have thought no more of it except perhaps to suggest he add some basic form of telepathy to an already accomplished list of accomplishments. I went to make a cup of tea during the week and found the tea caddy empty. No Barry’s! All I’d left was a drawer of funny-flavoured teas and I wasn’t quite that desperate. As I was dealing in childlike fashion with my disappointment, the doorbell rang. And there stood the postman, parcel in hand. In it? 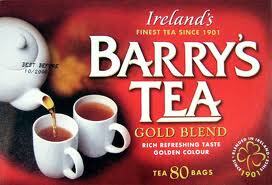 Some Barry’s Tea from the lovely Messes Stein and Nugent. Timing or what? In Prague on Thursday, wandering the streets, I wondered fleetingly where O’Ché’s pub might be. I’d heard MH & Co talking about it and was vaguely curious to see it. Not curious enough to look up the address beforehand, mind you, but curious enough, nonetheless. I turned a corner and there it was, as if manifested by magic. It seems as if things just keep on happening as I need them to happen. You’ll know, of course, that I am in Prague this weekend for a reason. I scattered Lori’s ashes from the Bridge on Friday and cried myself silly. Then, I got back to the flat we’d rented and logged on to find a host of messages from friends sending me good thoughts (thank you all). In amongst them was an e-mail that said: ‘I feel that Lori wants you to know this …..’ addressed to me as ‘Hey Girl’ – just as she would have done herself. And each time that you think of me, I know you’ll miss me too.